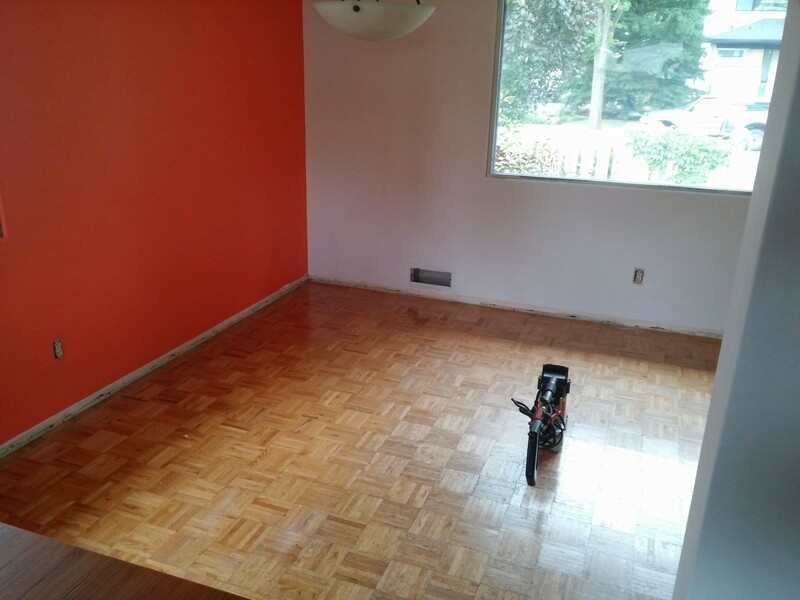 We had parquet flooring tiles in our living room. And parquet can be great, but this stuff was looking a little worn and sad. 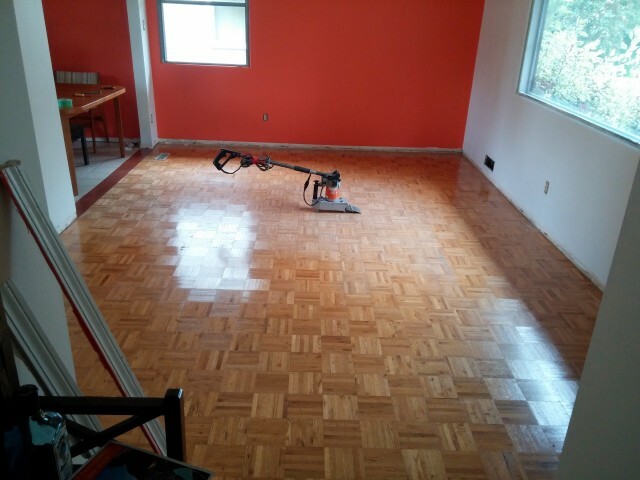 When we decided to do hardwood throughout the main floor, there was really no way we were going to leave the parquet. It would be easy and relatively inexpensive to just keep going with the hardwood. Also, I have always said that there shouldn’t really be more than two different kinds of floor coverings on any one level. It just breaks up the spaces too much and ruins any kind of flow from one room to the other. Plus transitions are pretty ugly in general. Parquet flooring tiles are small slats of wood wired together and glued down at alternating directions. It’s just a ‘wooden tile’ really. So step one is to go to the hardware store and rent a machine called a compact floor stripper that will make your life a hell of a lot easier. This machine is usually used for peeling vinyl tiles or linoleum from flooring, but the description mentioned it would work for parquet as well. It’s not like a ceramic tile removal machine which is really heavy and brutal. It doesn’t have as much power as that, so you still have to do a lot of work, but it’s nothing like having to remove the flooring by hand. 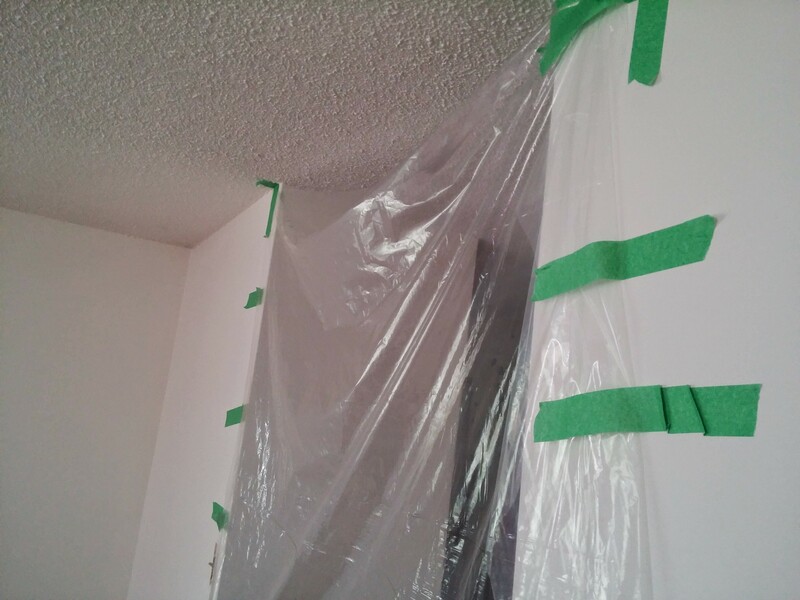 Second, you may want to put some poly-film over the openings into the room to keep the dust out. I did a pretty crappy job of taping this room off, but I didn’t care too much, I just wanted to minimize the dust. My painter’s tape was very poor quality so I went and got some better stuff for next time I want to partition off a room. This machine kicked up a fair amount of dust because it was splintering the wood and cracking the glue free of the floor. I wouldn’t want that floating around the house, so I closed off the room. Be sure to wear hearing and respiratory protection when working on pretty much any project like this. I have a respirator and I wore earplugs. The machine is quite loud and there is always dust. Eye protection is a good idea as well. You have to bend quite low to use this machine so the work is really hard. Ramming the blade towards the flooring edge seemed to work best and using some momentum as you went along would pop something like six tiles in a row. Hitting them at an angle works well too, and you can take a whole row of quite a few tiles off that way. Floor stripping tool making short work of removing parquet flooring. You might end up with some pieces of tile that you missed taking off with the machine. You can use a combination scraper tool and a hammer to chisel these off. Don’t use anything too sharp or you’ll likely gouge the floor, just a putty knife that’s pretty stiff will work fine, I’d guess. I used a 5-in-1 tool (a stiff putty knife with a chisel edge will do) for the job and it worked perfectly well. Getting the angle just right isn’t too easy. You can go too deep and gouge your floor, or you can be too shallow. Better to be a little too shallow as you can always take the tile off later. It requires a little finesse, but you don’t want to dig into your plywood. That could be an issue for you later. Here is what happens when you make the angle of the machine too shallow. A ramp you’ll have to scrape off later. All in all I rented the machine for 4 hours and got the job done for about $70. I took quite a few breaks to stretch my back out because I was bent over the whole time. This machine is not ergonomic at all, and the angle is hard to get right unless you’re bent over quite low. You do have to use a lot of force to get the tiles started, but I’m sure this machine made this job literally ten times faster. I hope this helps with anyone looking to remove parquet flooring from their plywood floor. I have seen videos of people doing this by hand with a long handled scraper like this one. Honestly, that might work if the glue isn’t that strong, but in my case, I can’t imagine it would have been easy. The machine was the way to go for my particular situation. Thanks for the great review. I have to tackle this same job this weekend and was considering renting this machine from HD as well. Glad to hear it worked for you. 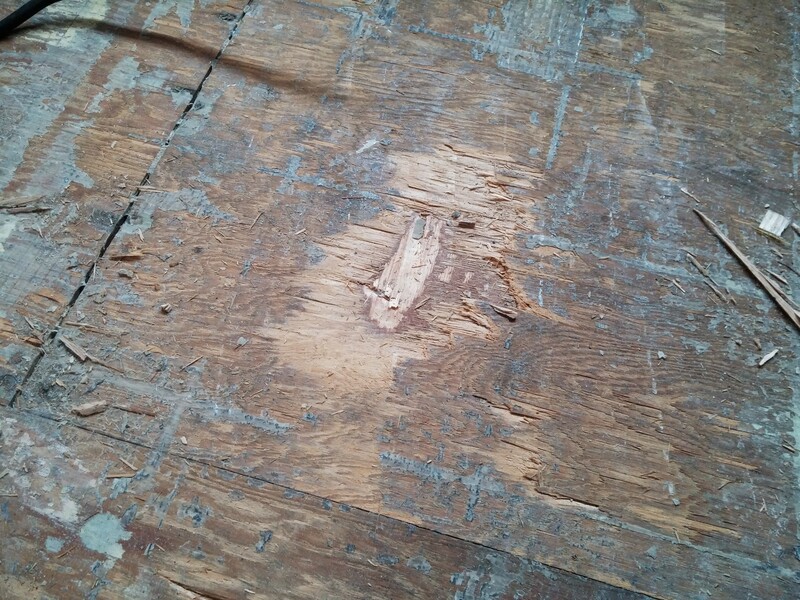 Did you bother fixing the gouges in the plywood or did you just span over them with the flooring? I didn’t fix the gouges. They were shallow and it wouldn’t have made any difference. I got a very high quality underlay and that would fill any voids anyway. With a thinner flooring it might have made a difference, but ours is 3/4″ narrow board hardwood with a zillion nails in it, so it isn’t going to flex. Do rent this machine. For sure it’s worth it. It is hard on your back when you’re using it, but I got mine up so quick. Not an ergonomic device for sure, but it worked well. And it was cheap. I rented the machine as well for what I thought it will be an easy 4h work … It took me 10h to do it!!! Very, very inconfortable position, lot of effort!!! One of my worst renovation days EVER!!! The glue was very strong and thick and the plywood below of quite low quality I would say. I paid $65 at Simplex here in Montreal for a 24h (incl. a blade). What do you say about fillings? Do it or not? A friend of mine used some cement adesive (expensive) as he put ceramic tiles on top. Me, I will put hardwood floor. Thanks for sharing your experience. It is very hard work taking off the flooring. My plywood seems to be good quality, and the glue was not so strong in my case. 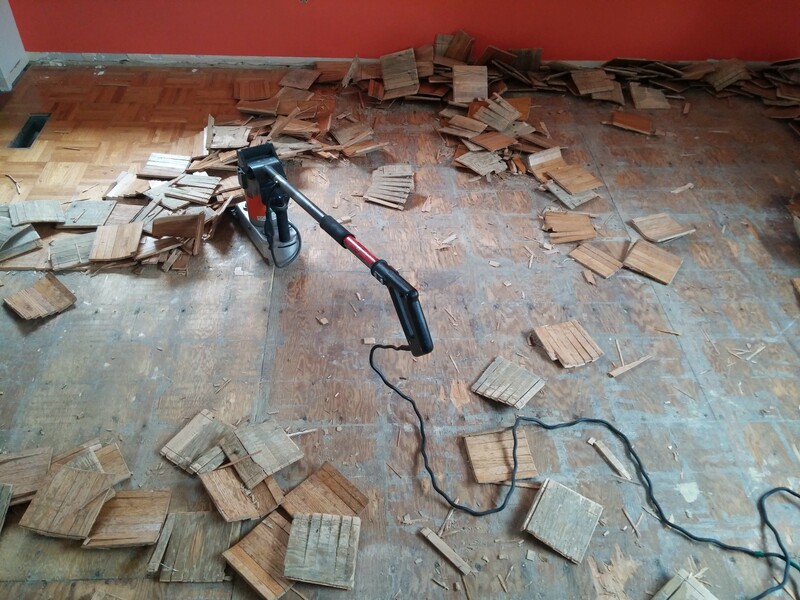 I was using hardwood, so I didn’t need to do anything to the floor after taking off the parquet. I don’t think you need to fill if you are using a thick hardwood. You would need to fill gouges if you are using a thin laminate or the floor is not very thick. If I was using tile, I would make sure the floor was stiff enough or add plywood before tiling. Thanks Alan for sharing your experience! We put in hardwood throughout the main floor. The gouges did not affect the installation. No squeaks with that many nails in the hardwood. 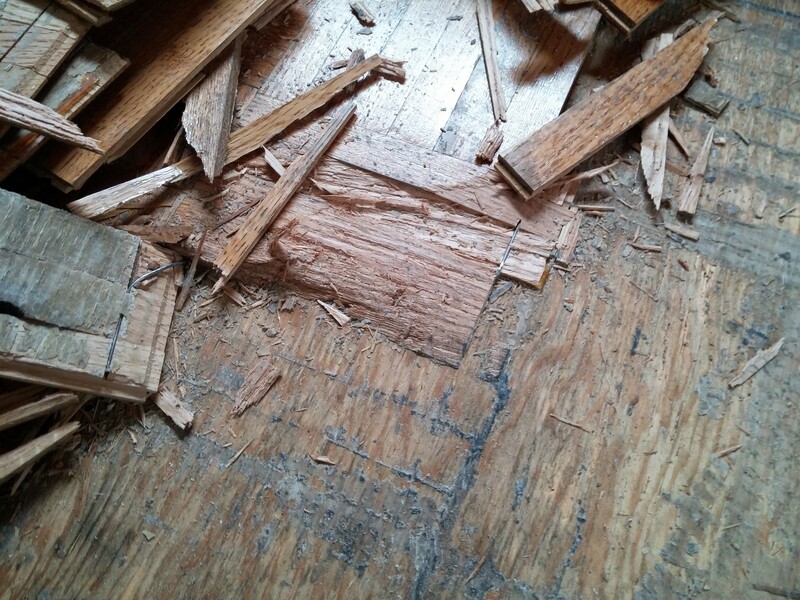 I am sure most parquet flooring is well glued down. You wouldn’t want it any other way. Until you remove it, that is. Thanks for commenting! Thanks for the very helpful information about how to remove parquet flooring, but please don’t scare people away from having different flooring in different rooms because of your personal opinion. I had an architect with the same opinion as yours and thankfully I ignored her and put carpeting in a room that I wanted to have a cosy feel. Hardwood was everywhere else, and I’ve gotten to the point where I think all that hardwood is boring. I love transitions and juxtapositions – it keeps things interesting.. Bland vanilla hardwood flooring everywhere simply to preserve “flow” shouldn’t be the reason to put hardwood everywhere. Save trees! Try tile. Or carpet. Or cement…. or whatever floats your boat.